Tergiversate – make conflicting or evasive statements; equivocate; use evasions or ambiguities; be deliberately unclear; change one’s loyalties attitude or opinions; abandon a belief or principle; turn renegade. From whence came that phrase? If you’re interested in language Grammarly is a source of education and entertainment. You’ll also find it on Facebook. Fonterra is facing a supplier crisis of confidence and risks haemorrhaging milk to private companies as fed-up farmer-shareholders react to its latest financial results. The co-operative turned in disappointing half -year results, with profit and revenue down on last year, and rocked farmers and the sharemarket with its announcement of a deterioration in the forecast dividend. The dividend tracks how the business is performing and was widely expected to be fattened or at least held steady, given the low milk price it is paying farmers this season. . .
Wintering dairy cows may be a useful pasture development tool but once the bulk of the regrassing’s done, sheep and beef can at least match the returns, say award winning North Otago farmers Blair and Jane Smith. They farm near Five Forks, inland of Oamaru, and if their name sounds familiar it’s probably because they won the Ballance Farm Environment Awards national title in 2012, though it may also be through the Newhaven Perendale stud flock. Newhaven is the name of the home farm, 230ha of rolling country with 193ha effective, while up the road they have Blairgowrie, a 1072ha hill block running from 450m to 650m above sea-level. . .
An ongoing dispute with a North Otago farmer who says he is at his wit’s end has landed the Otago Regional Council in the poo – literally. Five Forks farmer Robert Borst says the ORC’s water plan change 6A has ”destroyed us as a family” and provided four years of ”sheer frustration and exhaustion” for him and his wife, Sylvia. When told last night the ORC still hoped to resolve the dispute, he replied: ”Bull… – absolute bull…”. . . .
Poor water quality is threatening the future of one of Southland’s biggest industries, fishermen say. Seafood exports from New Zealand were worth $1.375 billion in 2014, up 3 per cent on the previous year. About $150 million could be attributed to the Southland coast, with crayfish accounting for two-thirds of that. But Bill Chisholm, spokesman for eel and blue-cod fishermen, said the future of the industry was being jeopardised by poor water quality as a result of sediment flowing into the ocean and estuaries. . . The death and illness of hundreds of dairy cows in Southland last year was due to the swedes they fed on having high concentrations of naturally occurring toxins, an initial assessment by the Ministry for Primary Industries has found. A ministry spokesman said the industry-led investigation into factors contributing to the deaths of cattle in Southland was still ongoing. But an initial assessment undertaken by the ministry supported the agriculture industry’s view that the cause of deaths were due to swedes having higher concentrations of glucosinolates, a toxin which naturally occurs in brassicas and is known to be toxic to cattle. . .
Pete Fitz-Herbert is the fifth Grand Finalist to be named in the 2015 ANZ Young Farmer Contest. The twenty-nine year old stock manager took first place at the Taranaki/Manawatu Regional Final in Palmerston North on Saturday 28 March. Mr Fitz-Herbert went home with a prize pack worth over $10,000 including cash, scholarships and products and services from ANZ, FMG, Lincoln University, Ravensdown, AGMARDT, Silver Fern Farms, Honda, Husqvarna and Vodafone. He also won the AGMARDT Agri-Business Challenge. Pete has been competing in the ANZ Young Farmer Contest since 2007 but this will be his first attempt at Grand Final level. Pete stock manages on the family farm and also runs a Dorset Down sheep stud. Pete is an active member of the Marton Young Farmers Club, where he enjoys networking with like-minded people and participating in a range of events. . .
Dave Witherow’s book, Open Season, An Angler’s Life in New Zealand, sat on my to-read shelf for weeks. I know little about fishing and my interest in it is no better than my knowledge. But I picked up the book last week and was not only hooked but reeled in by the tales of fishing, fishers and their adventures.
. . . The sheer pleasure of Dave’s abilities and craftsmanship always save the day. His writing has the same relaxed, discursive and illuminating brilliance of his conversation. . . This is why he managed to keep someone with little interest in fishing reading. He writes well, keeping the reader engaged with the adventures and escapades he and his mates have enjoyed. This includes crossing a flooded river on a raft constructed from lilos and building his own plane to enable him to get to good fishing spots more easily. Open Season is an easy and entertaining read which will appeal most to anglers and other outdoor adventurers, but could also hook those like me who know little about the sport. 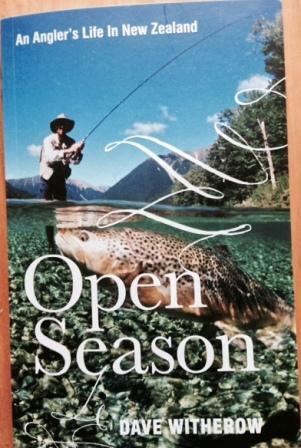 Open Season, An Angler’s Life in New Zealand by Dave Witherow, published by Random House. One of the big disappointments of the Northland by-election was that National went off-message. Until then the message was clear and consistent – a growing economy is the means for improved services and infrastructure, without compromising the environment, and National’s recipe for that is working. We’ve had sustained growth, without inflationary pressure, in spite of the financial and natural crisis the government has faced. That has been achieved by careful management of public finances while looking after the most vulnerable. A big part of the plan, and its success, is addressing the causes of long-term problems and thereby reducing the costs which go with them. This is why National has increased money for education and put more in to helping those most at risk from long term welfare dependence. It is why it has made delivering Better Public Services one of its priorities. To do this, we set 10 specific measurable targets in 2012 that we expected the public service to achieve over four to five years to improve the lives of New Zealanders, particularly the most vulnerable. These 10 targets are in areas that have been challenging to governments, not just in New Zealand but all around the world – such as welfare dependency, crime, child abuse, and educational achievement. This focus on results, and being accountable for achieving them, is changing the way the public service is thinking and operating. Three years on, we are making progress on all 10 targets and it’s now starting to make a difference that improves the lives of New Zealanders. In February 2015, we released our twice yearly update on the Better Public Service programme. Immunisation rates of young babies have reached an all-time high. Rheumatic fever rates have dropped considerably. Crime numbers continue to fall – the crime rate is now at a 35-year low. Last year nearly 5,000 people came off long-term JobSeeker Support benefits and into work. More 18-year olds are achieving NCEA Level 2. More young people are achieving higher qualifications. And the number of children who experienced substantiated physical abuse has decreased by almost 200, or 5.6 per cent, over the past year. There’s still a lot of work to do and we will continue to focus on making strides on the things that matter to New Zealanders and their families. These matter everywhere in New Zealand, including the provinces. But there is no doubt Northland had an itch to which Winston Peters applied his usual prescription of charm without substance. It is possible that no matter how good a campaign National ran it wouldn’t have been able to counter Peters’ persuasion. But there would have been a better chance of success had it stuck to its message and it must get back on to it. It has the right prescription and it must keep applying it everywhere including those parts of the country which, fairly or not, feel it isn’t yet addressing their ills.
. . . I love my son more than life itself, but, if years from now, when he is in high school, he should ring me one day and tell me that he is being sent home from a very important school sports trip because he has made a bad decision and broken the law, I will not take legal action to help him avoid the consequences of what he has done. I will undoubtedly feel greatly disappointed for him, and probably very angry about any personal time or financial investment that is about to be lost by my wife and I as a result of him being sent home from the competition. But I would also be keenly aware that there is something far more important than just money, time or sporting accolades at stake here, and that I, as his father, need to help him to understand that honour matters, and that sacrificing your integrity to compete in a sporting competition (even if you win) does not make you a winner – it makes you a man without character. . .
. . The simple reality is that fame is a cheating lover. Give it a generation or two and very few people will recall your names or your achievements. Perhaps the cricket die-hards will, there will no doubt be a plaque or two somewhere acknowledging what you have achieved. But the world is too small a place to remember the sporting deeds of many and each generation moves on to its own heroes. What will live on is character passed from parent to child, honour imparted and stewarded into maturity by a community to a young one. What will live on are the qualities that can exist in a human heart that steward the very life of humanity. And so I say thank you. Thank you for taking your global stage and as a unified team, displaying something more valuable than holding aloft a trophy. To New Zealand cricket, keep walking the path that you have started on. While you did not win the game, where honour and integrity are evident, you can never fail. I believe if you continue on in this manner, the trophies will come. I know that given the hopes you had as a team, a letter from an unknown nobody will probably mean very little right now. However, life has a funny way of taking what we once thought was an incredible achievement, and with expanded and matured sight, life proves what we thought to be incredible is actually fairly insignificant. It is for that reason that I hope each of you go forward to live the kind of lives where one day, perhaps months, years or decades from now, you read this letter again and recognise how invaluable it is to display honour, humility, character and compassion for the world to see. As a father seeking to reveal to them the beauty of his sons, thank you. Discalceate – to pull off or remove shoes, sandals or other footwear. You are currently browsing the Homepaddock blog archives for March, 2015.